Loved being so close to the airport! Excellent customer service. Convenient location - very clean - a little worn from high demand and volume but all in All I would stay there again. Excellent location, offers great dining options, very clean. It was in a great location! Staff was nice. The room was comfortable. The hotel room was just perfect for 2. The hotel shuttle was very punctual. The only thing I didn't like was that the towels and linens have a few hairs. With roots in business and trade, Dallas has grown rapidly since its early settlement in the mid-19th century to become a desired vacation destination. Today, four major interstate highways, an inland port and the Dallas/Fort Worth International Airport (DFW) make the city a hub of activity for millions of visitors each year. The third-largest city in Texas, this urban center offers everything from shopping at the flagship Neiman Marcus store to sprawling entertainment districts, multiple sports complexes, and an impressive combination of modernism and classic Southern hospitality. The early western history of Dallas lends itself to museums, so if you like historical and cultural sites, your options are many. One of the most popular choices is The Sixth Floor Museum at Dealey Plaza, which houses pieces of evidence that chronicle the tragic assassination of President John F. Kennedy in the city's streets in 1963. Other spots to check out include Pioneer Plaza, the Old Red Courthouse, and Southfork Ranch, where TV's Dallas was filmed. Art is so valued in this city that it has its own urban district. Visit the Dallas Museum of Art, Crow Collection of Asian Art and Nasher Sculpture Center, or just venture around the city on your own: outdoor sculptures and paintings are sprinkled throughout the streets. Despite its metropolitan appeal, Dallas is equally equipped to entertain children and families. If you enjoy flora and fauna, take in a bit of both at the Dallas Zoo, Dallas World Aquarium and Dallas Arboretum. For your more adventurous family members, journey to Six Flags Over Texas, Rory Meyers Children's Adventure Garden, and the Perot Museum of Nature and Science for fun of the more adrenaline-heavy variety. Dallas features a sizable range of local barbeque and authentic Tex-Mex restaurants, but being an urban hub, a variety of other cuisines are also available. The city's entertainment districts offer plenty of dance clubs, chic lounges and bars if you're interested in more lively nighttime experiences. For shopping, there are trendy boutiques and designer shops throughout the city and suburbs. With access to the country's first Neiman Marcus store and exclusive boutiques for designers such as Oscar de la Renta and Dior, there's not much Rodeo Drive has that Dallas can't offer as well. On the other end of the price scale are Dallas's outlet malls. If you're a sports fan, it doesn't matter when you visit Dallas. The city's local professional teams span a variety of sports, and their competitions cover all seasons. Take your pick of the five pro teams: the Dallas Cowboys, Dallas Stars, Texas Rangers, Dallas Mavericks and FC Dallas. 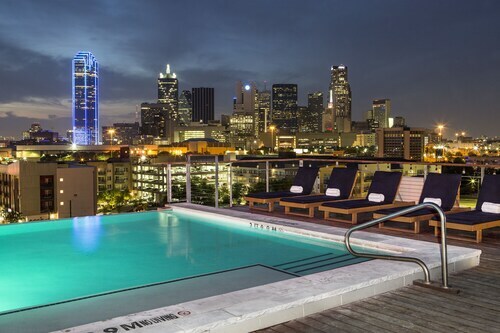 With such a sprawling urban location, Dallas hotels run the gamut from upscale to affordable. Many areas on the edges of the city offer luxury resorts and country club accommodations located directly on golf courses. The laidback atmosphere of these lodging sites is in stark contrast with the bustling boutiques available in downtown Dallas. Featuring all-inclusive spa packages and easy access to all Dallas has to offer, these city-center hotels make traveling throughout the metropolitan area easy. Whether you choose a relaxing resort or a busy business center, exceptional Texas hospitality paired with unmistakable Southern charm is all but guaranteed. Although it's located in the south, Dallas does experience weather variances with the four seasons. Visitors to this urban hub are most likely to arrive in March and April or September and October. These months represent the area's spring and fall temperatures in the 70s and 80s, perfect for walking around the city. 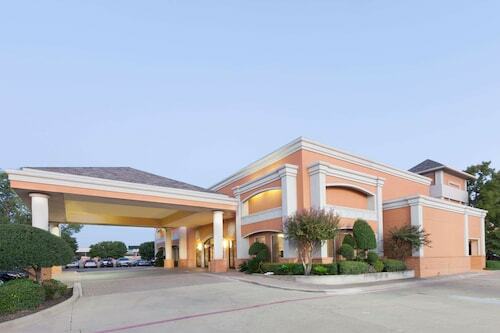 However, you will also experience higher travel and lodging costs as well as increased traffic due to business meetings and an influx of Dallas Cowboys fans. Summers see temperatures exceeding 100 degrees, which can lead to fewer travelers to Dallas and, by extension, lower prices for accommodations. The winter season experiences a similar decrease in population, with unpredictable weather that can even produce light snowfall. The possibilities in Dallas are as wide as the Texas sky. The city's traditional trademarks, like Mexican food and football, are perfectly complemented by the expanding areas of art and high fashion. Visit to see how these combined cultures help Dallas reinvent itself again and again. The rooms are spacious and beds are comfortable. We had a great stay at this hotel. Friendly staff too! Canvas has very cool, chic industrial decor and artwork displays. Studio style rooms are unique, spacious and comfortable. It's different from anyplace I've ever stayed. Good food, drinks and ambiance. The rooftop is incredible! I really appreciated the front desk staff's hospitality. I've read others complain about the bed, linens and pillows, but I thought that they were quite comfortable and slept like a baby. My room did have exposed concrete floors but was not a problem for me. I realize that may not suite everyone's taste, but I found that to be part of the charm. I'd like to return to Dallas just to visit Canvas again!